Biologist best known for his theory of Morphic Fields and Morphic Resonance. 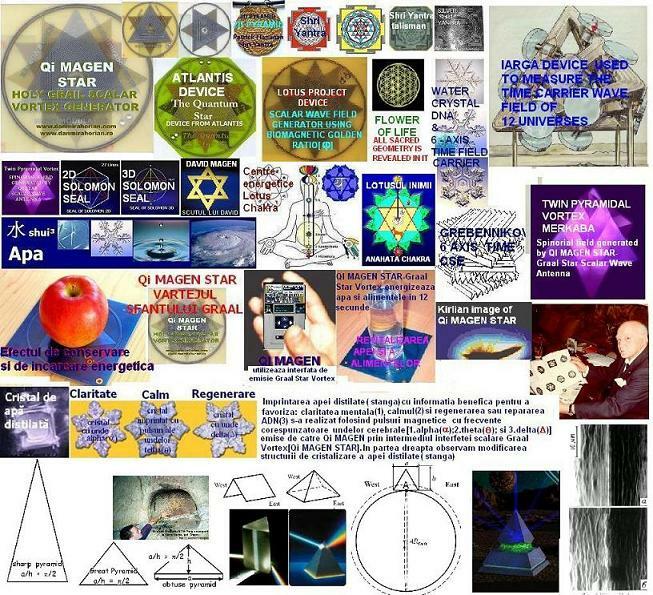 Jenny concluded that were examples of cymatic elements everywhere���\”vibrations, oscillations, pulses, wave motions, pendulum motions, rhythmic courses of events, serial sequences, and their effects and actions\”���and they effected everything including biological evolution. The evidence convincingly demonstrated that all natural phenomena were ultimately dependent on, if not entirely determined by the frequencies of vibration. He argued that physical healing could be aided or hindered by tones. Different frequencies influenced genes, cells, and various structures in the body, he claimed. In the book of Genesis it states that there are six days of creation. Yet many talk about the creation week ��� or seven days, and the Christian Bible views the number seven as the number of completeness. Why Seven? It is due to the influence of the Near Eastern culture at the time in which Jesus lived, when it was believed that there were only seven planets. When wrestling with adding a 7th number, I was mystically drawn to an article in Discover Magazine. In his newest book, Just Six Numbers, Rees argues that six numbers underlie the fundamental physical properties of the universe, and that each is the precise value needed to permit life to flourish. In laying out this premise, he joins a long, intellectually daring line of cosmologists and astrophysicists (not to mention philosophers, theologians, and logicians) stretching all the way back to Galileo, who presume to ask: Why are we here? As Rees puts it, \”These six numbers constitute a recipe for the universe.\” He adds that if any one of the numbers were different \”even to the tiniest degree, there would be no stars, no complex elements, no life.\” (From Discovery Magazine). uld these tones have played a role in the miraculous shattering of Jericho���s great wall in six days before falling on the seventh day? Some scientists are now stating that if we have been created, we most likely would have been sung into existence. Is it possible that the six days of creation mentioned in Genesis represent six fundamental frequencies that underlie the universe? Religious scholars believe both events occurred as a result of sounds being spoken or played. Other scientists, including the geniuses Nikola Tesla, Raymond Rife, as well as Mozart, Haydn, Beethoven, and Chladni, all must have known about, and used the concept of, the inherent power of threes, sixes, and nines. So we are dealing with three powerful numbers: 3-6-9. Everyone of the six Solfeggio Tuning Forks all add up, individually to the Pythagorean scheme of 3-6-9. In fact, because there are two sets of 3-6-9 (anagrams) in the solfeggio, they are even more powerful as these combinations serve as \”portals\” to other dimensions! As seekers whose paths converged in a mystery school, professions in psychology and healers of our childhood wounds, we���ve long been aware of our own yearnings to experience something mystical, larger than ourselves. Accompanied by a constant, imperceptible feeling that we came from ���somewhere else,��� our interactions with friends, clients, students and colleagues indicate that these feelings are not only common but perhaps universal. Virtually every culture has some tradition aimed at satisfying the spiritual quest for the Holy Grail. Some of the most ancient seekers utilized chanting, drumming and hallucinatory plants, while more contemporary ones have turned to meditation, mind-altering drugs and technology. Our experiences have provoked several critical questions. What exactly is the ���Holy Grail\” that so many are seeking? What drives this quest? Why does finding the ���Grail��� seem so elusive? Is it possible to get beyond being a seeker and become a finder? Our research reveals that much of the historical record of humanity���s quest for mystical ���Grail experiences��� is stored in Sumerian cuneform tables, Egyptian temples, Greco-Roman art and sacred Mesoamerican sites. Virtually all of the art, myths and temples from these ancient cultures contain step-by-step descriptions for having Grail experiences: expansion of consciousness, experiencing unconditional love, interactions with other dimensions, and the attainment of enlightenment. While these information repositories are readily available to us, they were carefully crafted to hide their real meanings from all but the most spiritually advanced. While the quest for the Holy Grail is an ancient theme, it appeared in the West only around 1180 AD. It is similar to other mythic quests such as Jason and the Argonauts��� quest for the Golden Fleece, the Seven Voyages of Sinbad the Sailor, and the tale of Cupid and Psyche. While all involve the concept of seeking, it is significant that only the search for the Holy Grail involves human blood. Legends about the Grail say it was the cup used at the Last Supper and at the crucifixion to collect the blood flowing from Jesus��� side and later hidden in a castle in Britain. Over the centuries, the location of the castle was forgotten. These events turned into legends about the Grail being hidden in a mysterious castle surrounded by a wasteland and guarded by a custodian known as the Fisher King who suffered from a wound that would not heal. His recovery and the renewal of the blighted lands depended on his finding the Grail. It was prophesied that the Grail would one day be rediscovered by the best knight in the land���the only man noble enough to make such a perilous journey. Galahad, Lancelot���s son, had a miraculous, though brief, vision of the Grail that set him on his quest. According to legend, he was permitted entry to the Grail Chapel and allowed to gaze on the great cup. His life became complete, and together, Grail and man were lifted to heaven. This illustrates a critical part of the legend: the knight who found the Grail would, like Galahad, become illuminated or self-realized. Unfortunately, the quest for the Holy Grail has become overly identified as an external search, rather than an internal journey of self-mastery. The early Christians with their Grail legends were not the only ones seeking mystical experiences to enlighten them and take them to heaven. Many indigenous cultures of Mesoamerica, particularly the Mayans, believe that center of the Milky Way Galaxy is the universal Source of creational energy, and that this energy begins as sound then becomes light. We have concluded, like the Mesoamericans, that the crux of the quest for the Holy Grail is to attune ourselves with the frequency of Galactic Center so that our soul can reunite with Source. Mesoamerican myths say that our souls originate at Galactic Center and return there between incarnations. ciousness because of alterations to the vibrational fields of language, color, music and timekeeping that once electromagnetically attuned us with Galactic Center. The impact of these changes on human consciousness has been immense, literally trapping us in duality. Human language, first called Babel, initially served as an avenue for expressing Godliness through the perfection of mathematics. Babel���s literal meaning is ���gateway to God.��� The Romans, with the Vatican���s blessing, substituted Latin for Hebrew as the language for sacred texts. Latin, which forms the foundation for many contemporary languages, lacks Hebrew���s mathematical perfection and ability to connect humanity directly to God. Indeed, the only way to recover language���s original sacred purpose, according to Henry, is to use the English language to synthesize and integrate key words and concepts from all languages into something he calls the Language of the Birds. This is one of the names given to the primordial speech considered by many linguists humanity���s Mother Tongue or Babel. Those who can speak this language are said to have command over the elements and are able to perform what appear to be miracles. Sound healer Jonathan Goldman, who writes about this ancient ���harmonic language��� in Healing Sounds, believes that it once allowed humans to communicate telepathically with all of nature���s creations. He theorizes that the Language of the Birds used sound to transmit information, and may be similar to sounds used by dolphins to transmit three-dimensional holographic thought-forms. Color, which as an aspect of light is ultimately an expression of sound, results from combining three primary hues. Today these are red, blue and yellow: the foundation for all modern color schemes. When combined, red, blue and yellow produce a muddy brown. The original primary colors were actually red, green and violet, which combine to produce brilliant white light when projected on a screen. The impact of this dubious change on human consciousness is immense, as it effectively ���dumbs down��� our visual perception. Musical sounds or tones were originally attuned to Source and are believed to be the frequencies used by God to create the cosmos in six days. Sacred chants such as the Gregorian contained notes that connected humanity to Source and, as a result, increased health and longevity. Current musical scales lack these six primary frequencies, known together as the Solfeggio Scale, which was only recently rediscovered. One of the Solfeggio notes, known as ���Mi,��� is the exact frequency used by genetic engineers to repair DNA. Prior to the rise of the Roman Empire, the first hour of the day began at 6 p.m. rather than at midnight, as shown in this figure. This change reversed the natural charting of time by the brain and decreased the synergistic functioning of the right and left brains. This not only ���dumbed down��� humanity but blocked the whole-brain integration that is a critical step in human evolution. Whole-brain integration is one of the major traits of geniuses and self-actualized individuals. You might think of the original or Mosaic clock as going ���tick-tock��� and the backwards Roman clock as going ���tock-tick.��� This alteration in timekeeping literally entrains the brain to vibrational frequencies that prevent people from electromagnetically attuning to the circadian forces of Earth. Even the calendar was changed in an effort to disempower the masses. Originally based on lunar or moon cycles, the calendar once contained 13 months and kept humanity attuned to natural rhythms through moon cycles and sun cycles such as solstices and equinoxes. The implementation of today���s Gregorian Calendar in 1582 effectively attuned humanity to technology rather than nature, as it focused attention on clock-based time rather than solar and lunar movements. Many indigenous traditions of Mesoamerica believe that Tula emits a frequency or tone known as Ge that not only heals the body/mind/spirit but provides immortality. We believe that the tone of Ge is inherent in the vibrational frequencies of the Language of the Birds, the original Gregorian Chants, the Solfeggio Scale and even primary color system that creates white light. These frequencies form the basis for all disciplines such as alchemy and esoteric religions that claim to lead people towards illumination or enlightenment. ent from Tula or Galactic Center to help humanity attune its DNA to the frequency of Ge so that we can return to Source. An analysis of the numerous DNA-tuning practices of ancient mystery schools revealed two primary approaches. The first of these, the Path of Nature, employs the sacred frequencies of the original linguistic, musical, color and time systems to attune human DNA to Source. A team of Russian geneticists and linguists, researching the electromagnetic behavior of DNA, discovered that ���junk��� DNA is critical not only for the construction of our body but also in data storage and communication. The Russian team discovered that this 90% of our DNA follows the same rules of grammar, syntax and semantics as human languages. Their conclusion is that human language mirrors the structure of our DNA. Leonardo da Vinci���s art indicates that he understood the sacred nature of the human body and its role in the evolutionary process. This is also true of the art of the ancient Goddess tradition, which shows the human body in positions resembling a tuning fork. The real message of ���Ge-sus��� appears to be that the human body IS the Holy Grail. It isn���t something ���out there.��� Like a tuning fork, the body can be tuned to different frequencies. At our present point in evolution, most humans are out of tune with Source. Unfortunately, the external search for the Grail has become obsessively emphasized and we have lost the real message that our body/mind/spirit is a Grail that can be tuned to the tone of Ge, which alters our DNA and makes our blood sing in harmony with Source. We believe that this is the real meaning behind the words, Holy Blood, Holy Grail. It appears that the purpose of the many tools and practices used in ancient traditions was precisely this divine attunement. Over time, the attunement of the DNA to the tone of Ge transforms the carbon-based body to one made of silica. As the physical body purifies, it slowly turns into refined light much like laser light, which opens initiates\’ perception to other dimensions. The lightbody then serves as a vehicle for interdimensional travel���a sort of human spaceship. (Image 10) The Heliopolitan mystery schools of ancient Egypt referred to this vehicle as the Mer-Ka-Ba���Mer meaning ���light,��� Ka meaning ���spirit,��� Ba meaning ���body.��� Mer-Ka-Ba means the spirit body surrounded by counter-rotating fields of light spirals that transports one between realities. Attuning the body to the tone of Ge appears to be the ultimate goal of many mystery teachings and the search for the Holy Grail so that we can find our way home to Source. ��1997 Carlisle Bergquist, MFCC, Ph.D.c. House of Vere & the Merovingians – an Antediluvian Dragon Bloodline? DNA – The God Code-Designed by aliens? V. Krasnoholovets, V. Byckov. Real Inertons against hypothetical gravitons. Experimental proof of the existence of inertons. Indian Journal of Theoretical Physics, vol. 48, no. 1, pp. 1-23 (2000) [http://arXiv.org/abs/quant-ph/0007027]. Sounds and music is food for the soul. There is good food and bad food and I am a bit worried about the music and vibrations our young people listening to. To agressive, to depressive and doomsday songs. I like to know: if you listen to chants or sounds played on crystal bowls, are they not distorted? The vibrations must be different. Totul este foarte, foarte interesant. Simt o mica frustrare datorata faptului ca limba engleza nu o stiu bine. Dar urmaresc sa ma descurc. Te asigur ca acord multa atentie la tot ce prezinti. …….That is interesting for all…… Comes and read times all. Than you for this most beautiful and infomative blog. As A Buddhist,I am well aware of the power of vibration – especially from the chant. I am healing myself this way.